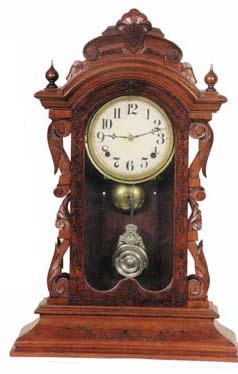 Ansonia Brass & Copper Co. parlor clock, "Fifth Avenue", ca 1874. 8 day bell strike, signed movement, running. Heavily carved and etched,24 inch walnut case is all original. Door is veneered with burl walnut, dial has new paper, pendulum is correct, label on the back. Ly-AnsoniaNo.1768.